M1 J7 SOX is...still dayburning. The old SON used to be group switched while the new LED lanterns have photocells so, someone hasn't figured out what to do with the SOX system yet, assuming they're keeping it (they appear to have relamped it all in January). If the price they have agreed with the energy company assumes that these units will not be powered during day time then the other party will not be happy. On another note, a second new column has appeared between J5 and J6 with Iridiums, except the height is now 14m instead of 12m. Some bowls from the lanterns supported by the catenary system (Phosco P415) are now missing or not attached properly. Connect Plus really won't replace them until the fat lady sings. Another SOX survivor which of late seems to have more or less bowed out completely, is the M67 stretch from Denton to Hyde. I think I counted only 5 or 6 MA60s out of approx 238 still working! 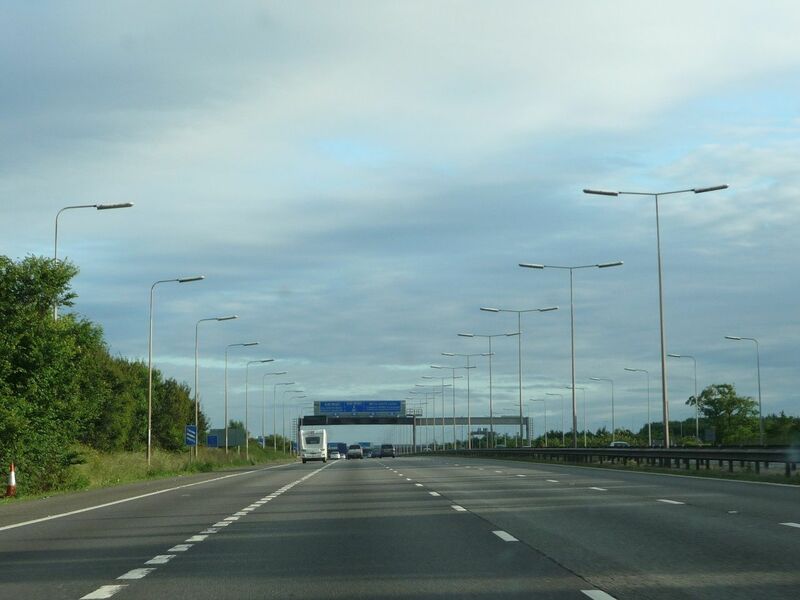 I can't recall quite when I last discussed the increasingly poor status of the SOX lighting on the M67, however I can now report that as of mid May 2018, the central res' MA60s and columns from J3 (Hyde) to J2 (Denton / A57) have since been removed. In the run up to this work, there was only 2 or so lanterns still operating. The slip road SOX on this portion are still in position, but are out of use. Further down towards Denton Roundabout J1 (A57 / M60), the lighting remains in situ, however none of it was lit this week. Of the slip roads here, only 3 MA lanterns were still working on 21.5.18. 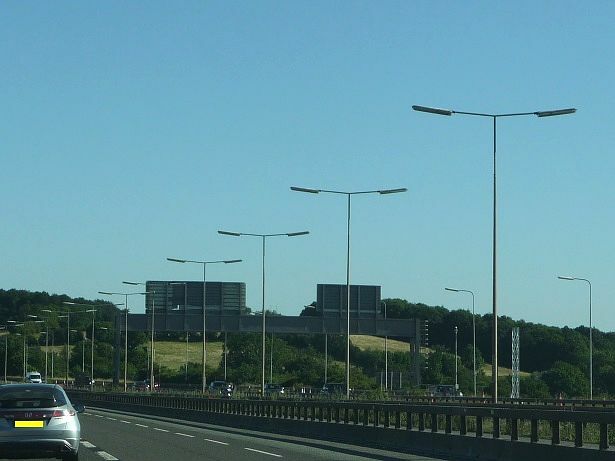 It remains to be seen as to when the remaining columns will be removed and if this motorway will get any replacement lighting. On a happier note, the M60 from Denton towards Bredbury still seems to be in relatively fine fettle SOX wise, as does the remaining portion adjacent to the Stockport Pyramid at J1. Can anyone tell me if the M1 at Kegworth (East Midlands Airport) is still lit by SOX? I was hoping to go down there to get some pictures this weekend. Today starts the upgrade in the area to a smart motorway, and driving down this morning I noticed that quite a few lights were now out. This could well be the beginning of the end for SOX lighting around the airport. At the wknd, all of the SOX lighting was still in place except for this short section on the left hand slip road up to the gantry in the background at J23a. The columns were still there but the brackets and lanterns had been removed, with some brackets still in the verge. Meanwhile the SOX lighting on the M69 is in poor condition especially at the southern end approaching Coventry. 2 fold down columns under power lines have been cut off at their bases, presumably due to structural issues with the columns. There are also further cut down columns. At J2, these columns are still lanternless. Well the SOX on the M1 at J24 East Midlands Airport and J23a is all but gone. This was the scene on 29th June 2013 - the image was also a Ukastle photo competition winner. I have another image from 2016, looking almost identical. Almost exactly 5 years later, this was the scene yesterday. The gantry has new sign frames, but its the same reference point. One short section of SOX lighting still survives south of this adjacent to the SON lighting. These may still be working. There are a few remaining columns further north at East Midlands airport at the northern start of the roadworks, but I suspect these are switched off and waiting to be removed. Expect a race to remove the last remaining SOX equipment within the next five years as Philips plans to end lamp production in precisely a year from now. Further to my reports on the erstwhile M67 in Greater Manchester, I can now confirm that the entire length is now bereft of its SOX lighting. The last few remaining columns on the central res' were removed a few weeks ago. All that now remains of the installation are the parapet mounted columns over the westbound entry slip at J1a (Denton / A6017). In addition to this, there are 4 off top entry GEC Z9465s which are still in situ beneath the bridge deck of the A6017, which passes over the motorway here. As the M67 looks almost rural without its MA60s, it was a thoughtful touch that HE decided to acknowledge the fact that this motorway was previously lit. This sign looks like it has been left behind, after the removal works were completed. On the M60 ring road around Manchester, SOX still hangs on in some parts. It's nowhere near as ubiquitous as it was a few years ago, and on my 2014 visit I found we could drive moderate lengths of time and see nothing but SOX across the entire carriageway - 180W in the middle and 135 on both sides. The areas which were previously rich in SOX, around Prestwich, are now in the dark, but unlike my 2014 visit where many southern stretches had almost all lamps out, there appears to have been a group relamp and some parts look surprisingly tidy. I pretty much called it a day after that as I don't think I'll ever see an installation of SOX that betters it! Junction 24 of the M1 is now lit up with Luma`s. The lights from 23a up, were off when I went past yesterday morning. 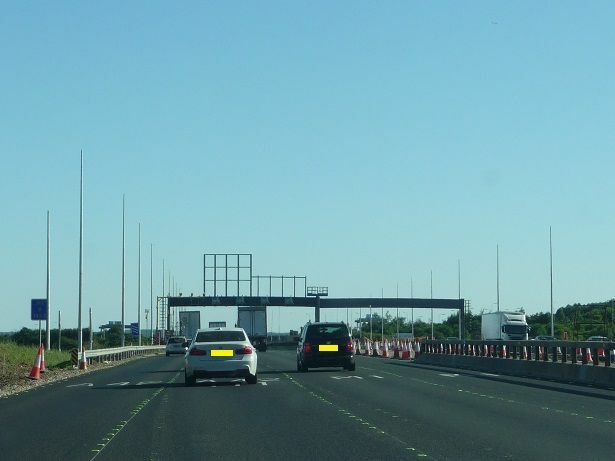 Whilst driving down the stretch of slip road onto the M60 clockwise at J24 (Denton / A57) I noticed that the recently installed Lumas like others in the UK, have been modified and are now fitted with a safety bond. I’ve just found out that all the SOX lighting on the M1 between J5 and 6A has been fully switched off since last week. That includes the catenary section. In addition, the slip roads of J6 are now lit by LED lanterns. A sign of things to come for the main carriageway potentially? So are they going for good now? I hadn't noticed any scheduled roadworks. Also, found these stock images on the net but can't find where they are. Says they're on the M1 at the Watford Gap in Northamptonshire. One looks like it's at a service station yet I have looked at every station on the M1.